The Ragged Flagon - Cistern is the Thieves Guild's headquarters in Riften. It is connected to the Ragged Flagon, but also has its own secret entrance in Riften's cemetery, located beneath a tomb that dominates the small graveyard to the east of Riften's Hall of the Dead, which can be accessed once you joined the Thieves Guild. To open, press a small button in the center of the tomb to reveal a stone staircase. Descend it and open the sewer covering to access the cistern. The Ragged Flagon - Cistern is inaccessible until you have joined the Thieves Guild. (†) Other Thieves Guild quests exist, but do not require you to enter the cistern. You will initially be taken there by Brynjolf. He will lead you after meeting him in the Ragged Flagon to a storage cabinet with a false back, behind which is a passage with a small bedroom on the right and that leads into the main headquarters for the Guild in the Cistern. The bedroom contains two owned beds with an end table between them, two cupboards, a round table with a bottle of wine and an unlocked chest. All are flagged with the red "steal" message but are easy pickings. When you first enter the cistern, Mercer Frey will be awaiting you in the center of the room, with five other thieves present round the room; Cynric Endell, Niruin, Rune, Vipir the Fleet, and Thrynn. Other thieves return or arrive as you complete specific quests; Sapphire returns once you have completed the Stabilized quest for Shadr. Etienne Rarnis moves here once released from the Thalmor Embassy during Diplomatic Immunity. Finally two new thieves, Garthar and Ravyn Imyan join the guild once you have started to return the Guild to their former glory. The cistern consists of a large circular chamber with two storm drains emptying from the ceiling high overhead, to fall as waterfalls into a pool under a cross-shaped stone walkway. There are wooden suspension bridges linking each quadrant around the outside. All containers, excluding barrels and the chests within the training room used for practicing lockpicking are safe for storage. There is a pair of cupboards containing clutter flanking the tunnel leading into the room from the Ragged Flagon. Nine single owned beds in addition to your bed, all coming out from the outer walls, many of which have unlocked guild chests at the foot of them all containing minor loot. There are several end tables beside the beds, around the room. The first bed on the right when entering from the Ragged Flagon is assigned to you. There is an additional pair of thieves guild gloves and boots on the floor either side of your bed. Around the room are several bottles of alto wine, wine and Nord mead, along with a few common books and three copies of Shadowmarks which explains the meaning of the different symbols scattered across Skyrim. 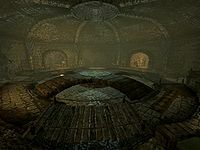 Several notes can be found around the room including ones titled East Empire Connection, Eyes Open, and No Word Yet, all of which give insights to the Guild and/or some of its members. Opposite the entrance, to the southeast, in an alcove is a pair of double metal doors that require two keys that guard the Guild's treasure room, with a table and barrel to the left and another cupboard containing clutter to the right. There is a desk further to the left of the alcove, where Mercer Frey is normally found. On the desk is the business ledger and two lockpicks. Behind the desk there are some sets of shelves that, as you acquire certain unique items as part of The Litany of Larceny quest and sell them to Delvin Mallory they appear on the shelves or desk. Also once you have stolen five of each of the seven items during The Sweep Job or The Burglary Job quests for Vex, representation are added to these shelves. Between the sets of shelves is a blank bust, which is used display Barenziahs Crown, once you collect all twenty-four of the unusual gems and recover the crown as part of the No Stone Unturned quest. To the right of the alcove is a grindstone and barrel in front of a row of four weapon racks holding an iron and steel dagger and sword. To the right of the rack are three archery dummies, where Cynric, Thrynn and Ravyn Imyan (after he joins) spend hours each day honing their archery skill. In the alcove to the southwest is a ladder leading to the alternative entrance. On the left of this is a long wooden table with a bottle of wine, a loaf of bread and a goat cheese wheel on top and to the right is a cupboard of clutter. In front of this is a cooking pot on a stand, beside another cupboard holding two red and a green apple, four tomatoes, a bottle of alto wine and several pieces of cheese. Opposite, to the northeast is a passage with a long wooden table on the right laid with a bottle of alto wine, a horker loaf, two pieces of cooked beef, two loaves of bread, a cabbage, an eidar cheese wheel. Beside the table is a cupboard holding two boiled creme treats, a bottle of alto wine and some bread and cheese. To the left of the passage is an alchemy lab. The passage takes a couple of turns before entering a training room - see below for details. During the Thieves Guild quest The Pursuit you will find that when you enter the cistern from the Ragged Flagon, Vex, Delvin and Brynjolf are standing by the entrance with their weapons drawn. By the alternative entrance are Vipir the Fleet and Sapphire, by the passage leading to the training room are Niriun and Cynric Endell, with Rune standing a short way behind them and Thrynn in the training room. After both you and Karliah explain yourselves, Brynjolf asks Delvin to unlock the treasure room. Once both Delvin and Brynjolf have unlocked the door, you are all able to enter and find Mercer has emptied all seven treasure chests within. There are a couple of small wooden tables in the room with a selection of steel weapons on top and a food barrel in the corner. The locked vault door remains unlocked, unless you stay away from the Cistern for long enough for it to reset, which will reset the doors to locked. Completing the first reputation quest adds two new Thieves Guild banners high on the walls either side of the treasury room. The table to the southwest is laid with two bottles of alto wine, a baked potato, pheasant roast, raw rabbit leg, two potatoes, a salmon steak, a seared slaughterfish steak, as well as several more loaves of bread and pieces of cheese. Hanging above the table from racks are four rabbits, four pheasants and two whole salmon. A shield plaque is installed above the weapon racks to the right of the treasury room with a banded iron shield and crossed iron greatswords. Completing the second reputation quest adds two extra cupboards either side of the ladder leading to the concealed exit by the graveyard. Rugs are added throughout the zone and two more banners are hung from the walls above the passage to the training room. Completing the third reputation quest makes two new thieves, Garthar and Ravyn Imyan, join the Guild. Two more banners are hung from the walls above the concealed entrance. Completing the fourth and final reputation quest adds two final banners high above the exit/entrance to the Ragged Flagon. After you complete the Darkness Returns quest, a shrine of Nocturnal is installed in the water between the entrance leading from the Ragged Flagon and the training room. When activated, you will be granted the Blessing of Nocturnal, a 10pt boost to your Sneak and it cures any diseases you may have contracted. After completing the Thieves Guild questline, a long guild tribute chest appears before the desk. You can unlock this chest with a key given to you by Brynjolf and claim the items left as tribute for you. Upon completing 125 side quests for Vex and/or Delvin a safe is also added. It contains several archery targets, both at ground level and in alcoves high on the walls, practice dummies, many more food barrels, a whole range of different locked chests, each with a different leveled lock from novice up to and including master. There is a note on the ground in front of them, which explains they are for practice use and that they reset after a short amount of time. There is also an unlocked guild chest, two cupboards, a table and two end tables against the walls. On these are an iron and a steel greatsword, an iron dagger, a complete set of thieves guild armor including hood, gloves, boots and cuirass, a pickaxe, and a copy of the Lockpicking skill book Advances in Lockpicking. If any of the guild members see you picking the locks in the training room, they will interrupt you by commenting on it as if you weren't meant to be picking them. Esta página foi modificada pela última vez à(s) 16h43min de 21 de março de 2015.